Running Board Covers includes steel backs just like originals. Made of the finest grade of rubber with high UV resistance. Precision moulded in steel dies. We do also sell the rubber without steel backing under separate listing. 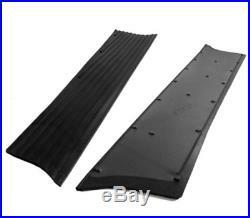 The item "Chevrolet Chevy Running Board Mat / Cover Set Moulded Rubber 37,38 1937-1938" is in sale since Friday, March 29, 2013. This item is in the category "eBay Motors\Parts & Accessories\Vintage Car & Truck Parts\Exterior\Other". The seller is "ammuscle" and is located in Greenville, Ohio.